Before you install and configure Windows PowerShell Web Access, we recommend that you read this entire guide, which includes instructions about how to install, secure, and uninstall Windows PowerShell Web Access. The Use the Web-based Windows PowerShell Console topic describes how users sign in to the web-based console, and covers limitations and differences between the web-based Windows PowerShell console and the powershell.exe console. End users of the web-based console should read Use the Web-based Windows PowerShell Console, but do not need to read the rest of this guide. 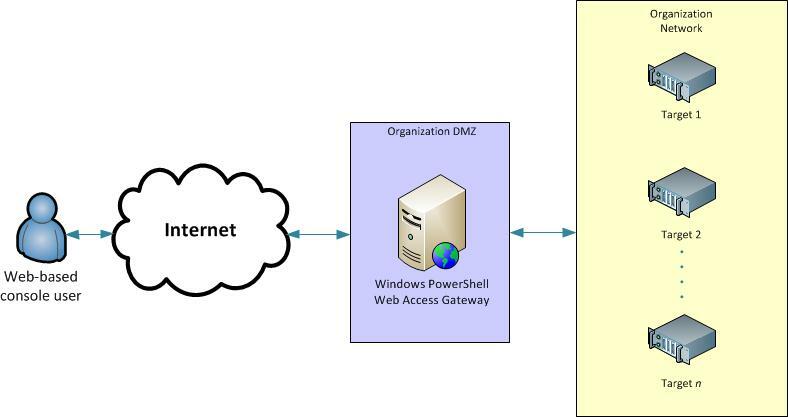 This topic does not provide in-depth Web Server (IIS) operations guidance; only those steps required to configure the Windows PowerShell Web Access gateway are described in this topic. For more information about configuring and securing websites in IIS, see the IIS documentation resources in the See Also section. Type the following, and then press Enter, where computer_name represents a remote computer on which you want to install Windows PowerShell Web Access, if applicable. The Restart parameter automatically restarts destination servers if required. Installing Windows PowerShell Web Access by using Windows PowerShell cmdlets does not add Web Server (IIS) management tools by default. If you want to install the management tools on the same server as the Windows PowerShell Web Access gateway, add the IncludeManagementTools parameter to the installation command (as provided in this step). If you are managing the Windows PowerShell Web Access website from a remote computer, install the IIS Manager snap-in by installing Remote Server Administration Tools for Windows 8.1 or Remote Server Administration Tools for Windows 8 on the computer from which you want to manage the gateway. To install roles and features on an offline VHD, you must add both the ComputerName parameter and the VHD parameter. The ComputerName parameter contains the name of the server on which to mount the VHD, and the VHD parameter contains the path to the VHD file on the specified server. After Windows PowerShell Web Access is installed, you are prompted to review the readme file, which contains basic, required setup instructions for the gateway. These setup instructions are also in the following section, Step 2: Configure the gateway. The path to the readme file is C:\Windows\Web\PowerShellWebAccess\wwwroot\README.txt. We strongly recommend that administrators configure the gateway to use a valid certificate that has been signed by a CA. The UseTestCertificate parameter should only be used in a private test environment. For a secure production environment, we recommend using a valid certificate that has been signed by a CA. In this example, the resulting website for Windows PowerShell Web Access is https://< server_name>/myWebApp. You cannot sign in until users have been granted access to the website by adding authorization rules. For more information, see Step 3: Configure a restrictive authorization rule and Authorization Rules and Security Features of Windows PowerShell Web Access. The Windows PowerShell Web Access web application is now configured to use your signed SSL certificate. You can access Windows PowerShell Web Access by opening https://<server_name>/pswa in a browser window. Optional step for restricting user access by using session configurations: Verify that session configurations that you want to use in your rules already exist. If they have not yet been created, use instructions for creating session configurations in about_Session_Configuration_Files on MSDN. This authorization rule allows a specific user access to one computer on the network to which they typically have access, with access to a specific session configuration that is scoped to the user’s typical scripting and cmdlet needs. In the following example, a user named JSmith in the Contoso domain is granted access to manage the computer Contoso_214, and use a session configuration named NewAdminsOnly. Verify that the rule has been created by running either the Get-PswaAuthorizationRule cmdlet, or Test-PswaAuthorizationRule -UserName <domain\user | computer\user> -ComputerName <computer_name>. For example, Test-PswaAuthorizationRule –UserName Contoso\JSmith –ComputerName Contoso_214. Instructions in this section are for installing the Windows PowerShell Web Access web application in a subdirectory—and not in the root directory—of your website. This procedure is the GUI-based equivalent of the actions performed by the Install-PswaWebApplication cmdlet. This section also includes instructions for how to use IIS Manager to configure the Windows PowerShell Web Access gateway as a root website. In the Alias field, type pswa, or provide another alias. The alias becomes the virtual directory name. For example, pswa in the following URL represents the alias specified in this step: https://<server_name>/pswa. In the Physical path field, browse for the location of the application. You can use the default location, %windir%/Web/PowerShellWebAccess/wwwroot. Click OK. Optional security step: With the website selected in the tree pane, double-click SSL Settings in the content pane. Select Require SSL, and then in the Actions pane, click Apply. Optionally, in the SSL Settings pane, you can require that users connecting to the Windows PowerShell Web Access website have client certificates. Client certificates help to verify the identity of a client device user. For more information about how requiring client certificates can increase the security of Windows PowerShell Web Access, see Authorization Rules and Security Features of Windows PowerShell Web Access in this guide. Open the new Windows PowerShell Web Access website, https://< gateway_server_name>/pswa. You cannot sign in until users have been granted access to the website by adding authorization rules. Because the root website points to the Windows PowerShell Web Access folder, the browser should display the Windows PowerShell Web Access sign-in page when you open https://< gateway_server_name>. You should not need to add /pswa to the URL. Click Create Certificate Request to request a certificate from a CA such as VeriSign™, Thawte, or GeoTrust®. The certificate's common name must match the host header in the request. For example, if the client browser requests http://www.contoso.com/, then the common name must also be http://www.contoso.com/. This is the most secure and recommended option for providing the Windows PowerShell Web Access gateway with a certificate.